Last week, I sent in the draft manuscript for my next book–“a memoirish examination of the politics of cricket fandom”–to the editors at Temple University Press. The book, whose description, not title, I have indicated above, will now be reviewed, revised and then finally rolled off the presses as part of the series Sporting, edited by Amy Bass of the College of New Rochelle. By way of providing an introduction to the book, I’ve taken the liberty of excerpting–what else–the book’s introduction below. I suspect that Samir Chopra and I were born to at least correspond. His blog profile lists as his interests ‘cricket, free software, military history, military aviation, hiking, tattoos, industrial music, travelling’. I don’t necessarily share those interests—although the military and musical tastes overlap—but they are interesting, and he brings to his cricket writing the sort of well-stocked and free-ranging mind ever in short supply. Cricket bloggers have a tendency to come and go, say what they have to say, and move on. Samir, I think, gets better and better. I enjoy his style of taking a stray or miscellaneous pensée, then comparing and contrasting, unpicking and elaborating, until a surprisingly rigorous argument has been constructed and a provocative conclusion reached, whether it’s that Andy Flower had a nerve asking India to withdraw its run-out appeal for Ian Bell at Trent Bridge in 2011, or that Fire in Babylon was frankly overpraised—views I happen to share, although that is less the point that Samir makes such trenchant yet civil cases. They are like watching cricket with a thoughtful and challenging companion. Perhaps these are the conversations Samir would like to have had with someone at a Test match, but, alas, has had to conduct with himself in his self-imposed east-coast American exile. If so, we’re fortunate that he’s condemned to partake of his cricket by the interwebs in splendid isolation, as he describes in another lovely cameo here. There was a lot that set me nodding in Eye on Cricket, in recognition and assent. Yes, sport is grossly overstuffed with martial imagery; yes, I also tend to appraise every library by what is on the shelves at 796.358. Being one himself, Samir understands the ‘playing fan’ and the vernacular cricketer with great acuity. ‘No game, no physical or cultural endeavour, can survive or be sustainable if held aloft only by the efforts of those most proficient at it,’ should hang in a gilded frame in the office of every cricket administrator. I revelled in cricket-nerdish references to a light appeal by Sew Shivnarine, and to ‘Kirti Azad’s Finest Hour’ too. I’d read many of these pieces previously, yet was struck by how well they cohered in this collection—it was almost as though Samir had been unconsciously working towards this totality all along. I am surprised only that he has never written anything about Jade Dernbach. After all, it would bring together two of his interests. Over to you, Samir. In Eye on Cricket, Samir Chopra, a professor of philosophy and a long-time blogger at ESPNcricinfo, offers us a deeply personal take on a game that has entranced him his entire life in the several lands he has called home. 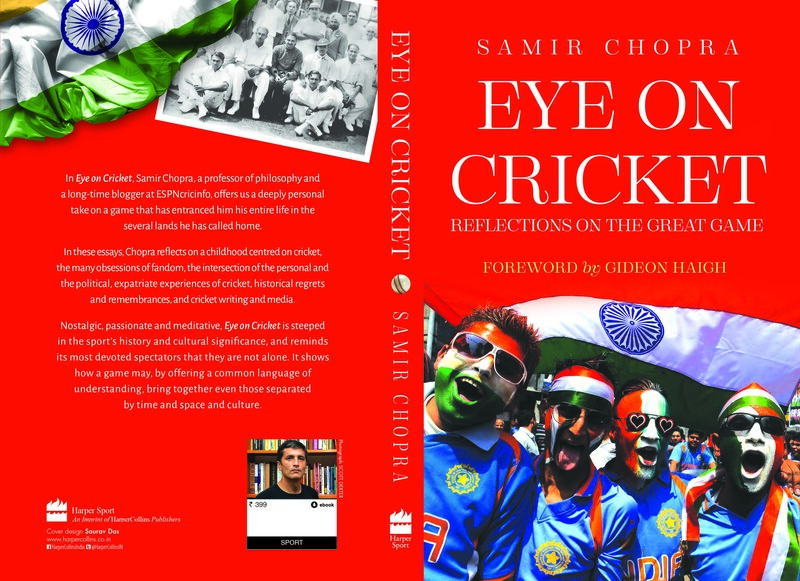 In these essays, Chopra reflects on a childhood centred on cricket, the many obsessions of fandom, the intersection of the personal and the political, expatriate experiences of cricket, historical regrets and remembrances, and cricket writing and media. Nostalgic, passionate and meditative, Eye on Cricket is steeped in cricket’s history and its cultural significance, and reminds the most devoted spectators of the game that they are not alone. It shows how a game may, by offering a common language of understanding, bring together even those separated by time and space and culture. There is nothing essential about cricket’s place in the Indian imagination or sensibility; its position is not protected by any mystical guarantees of durability. It is a cultural activity, one with a history of contingencies propping it up; it must compete for time and attention and emotional investment with all the other offerings of this variegated world. Perhaps, almost unimaginably, it will recede from Indian shores, leaving behind some archaeological traces of its once iron-clad hold on that land. My latest post at The Cordon at ESPN-Cricinfo is titled ‘The Renewability of Cricket‘. I want to suggest here that “we, as players and spectators” have a great deal to do with the perceived complexity of cricket. Quite simply, this is because we change over time; we do not bring, to our encounters with the game in the middle, a stable, enduring entity, but one subject constantly to a variety of physical, emotional, psychological, and of course, political variations. This perennially in flux object brings to its viewings of cricket a variety of lenses; and we do not merely perceive, we interpret and contextualise, we filter and sift. (As John Dewey, the great American pragmatist philosopher noted, “Thought is intrinsic to experience.”) These interpretations and contextualisations change over time. The 45-year-old man, the professor, the older version of the once-15-year-old schoolboy, sees a very different game of cricket from his younger counterpart. And as he continues to “grow” and change, he will continue to “see” a different game played out in front of him. He will renew cricket, make it extensible and renewable. The seemingly infinite variations possible in a 30-hour, 450-over encounter between 22 other humans, each playing cricket ever so differently from those that have preceded him, will provide ample fodder for this extensibility and renewability. A game of cricket exists within a larger symbolic order of meaning. When a young spectator sees men in white pick up bat and ball, he understands their activities within a perceptual framework in which active fantasy and wishful longing play an active part. As he grows, matures, acquires a political and aesthetic sense, and hopefully expands his intellectual, emotional and romantic horizons he will revise this, and come to understand the game differently. He may go on to watch umpteen variations on the fourth-innings chase theme, and each one will be uniquely located within this under-construction framework. As I note on my ‘About‘ and ‘Miscellaneous Writings‘ pages, I blog on cricket at ESPN-Cricinfo’s The Cordon. (My fellow Cordonistas are quite an illustrious bunch: they include Nicholas Hogg, Jonathan Wilson, Jon Hotten.) A link to all my posts there is available on my ‘Miscellaneous Writings‘ page. I have not thus far provided links to my posts over at The Cordon; from now on, on the days I do, I will post a link and take ‘the day off’ here. To get things rolling, here is my latest post at The Cordon, The Joys of India-Pakistan By Proxy. As my About page indicates, I am currently working on “a memoirish examination of the politics of cricket fandom” (contracted to Temple University Press, for the series Sporting, edited by Amy Bass). Writing it has proven harder than I thought. I began writing the book late in 2001 and had a hundred-thousand word draft ready late in 2004. I wrote with little guile, wanting to get my memories committed to paper, organizing in them nothing more sophisticated than a simple linear narrative. First this happened, then this, and so on. I organized the material in the only way I knew: by chunking it into simple temporal segments. I gave the draft to a couple of readers, and then forgot about it because I had other writing projects at hand. Five years later, I submitted my draft to a couple of trade publishers. One sent me a rejection, the other never replied. I then sent it to an editor recommended me by an acquaintance, and she rejected it too. I then sat on the book for another couple of years before making contact with Amy and sending it to her. She liked the project, and after a full review process at the press, I signed a contract. And then I returned to work on a nine-year old draft. Unsurprisingly, I found a great deal of material I did not like. More importantly, I soon ran into a greater difficulty: it is hard to tell a coherent story about yourself – especially for public consumption. We are the central characters of our lives. The stories we tell ourselves about ourselves are subject to constant, ongoing revision; we are good at forgetting, suppressing, and embellishing the little details that make it up. (By our actions and our pronouncements we are also spinning one version of this story for everyone else.) This closeness of the narrative and its constantly shifting nature means that writing about it was always going to be challenging. And how. I frequently find myself quite puzzled by the character in the story I am writing. I don’t fully understand him and would like to make him more comprehensible. But doing so, perhaps by greater confessional revelation or forensic detail, is not as straightforward as it seems. We have forgotten a great deal, and we often remember incorrectly. And sometimes, in an attempt to make more palatable the unvarnished truth, we might introduce incoherence elsewhere in the narrative structure–there is a thread that binds, and it can snap if stressed too much. It is all too easy to second-guess oneself: What do I really need to tell the reader? Was this a good idea to begin with? We might construct a too-sanitized picture of ourselves, suddenly struck by timidity at the thought of exposure. Lastly, we sometimes sense that we have layers and layers of complex detail that need unpacking; a really coherent story about ourselves, one that we often take hundreds of hours to recount in a therapist’s office, might simply be too much for the written page; writing it sounds like a lifetime’s labors. And it would be tedious in any case, of little interest to anyone but ourselves. I am not yet close to solving these challenges; I expect to write that dreaded email asking for an extension–beyond the summer, to the end of the year–all too soon. Been thinking about how you and I love sport, how it really means something to us, how we cheer for our teams and are gutted when they lose. Yet we all know that sport (particularly non-participatory sport) is just another way the bosses keep the people distracted from the main game. Is it? Well, yes. My friend is right, and he certainly doesn’t need to convince me. After all, here, on this blog, I’ve alluded to ‘the massive narcotizing effect of professional sports’ and waxed critical about the shamateurism and excesses of college football. The puzzle, if there is one, is why folks who consider themselves alive to the political dimensions of the social, economic and cultural phenomena they encounter, who are ever so ready to offer critique and revisionist commentary, so blasé about professional, big-budget, franchise-based sports, all of which are so very distant from the game played in neighborhood parks? Why are they so ready to believe the patently false premises of college sports?